Solar eclipses happen almost every year somewhere on earth. There was a total eclipse in February 1979 in the United States. 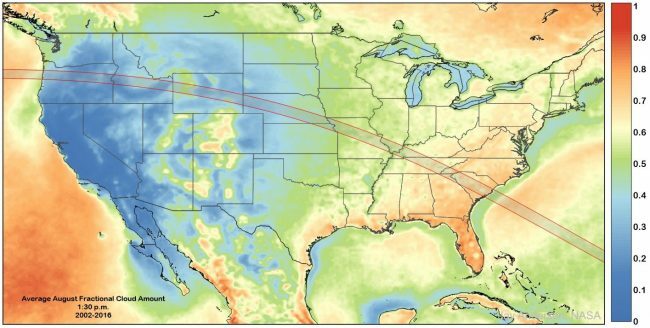 But the last time a total solar eclipse took place across the entirety of the continental United States was on June 8, 1918, when it started at South Bend, Wash., near the mouth of the Columbia River, and cut right across Orlando and central Florida, with the shadow of the moon traveling–as it will again next week–at about 33 miles per second. The time period of the eclipse locally will be approximately 1:18pm to 4:13pm, with the maximum coverage happening at 2:49pm. “We are fortunate enough to witness the solar eclipse at about 85 percent totality,” Heidi Alves, a science curriculum specialist, says. “While this is a unique experience that has not occurred in this capacity for around 99 years, we want everyone to view this eclipse safely. We will be providing a safety information sheet available to all families in preparation for this rare event.” Principals and their staff will ensure outdoor eclipse-viewing events are done safely, the district’s release stated. And don’t be superstitious. More details here. For NASA television coverage, including apps and the rest of it, go here. If you’re stuck inside and you want to watch the eclipse online, The Times has a page rich with suggestions here. And if you’d like to keep your eyes open for an actual, total eclipse in Bunnell, Flagler County Emergency Services’ Bob Pickering tells us that it’s only 28 years away, in 2045.